We have gardener friends around the globe who are willing to exchange their unique finds with us. We, in turn, hope to be able to grow enough of these special plants (including many heirlooms from other countries and cultures) to share with you, the dedicated gardener. All of the plants in the list that follows may not be immediately available, and come nowhere near being everything in our grow list for spring 2010, but if you tell us of your interest, we'll put you on the waiting list to receive it as soon as it's available. Some will be in very short supply, and all will be sold on a first-pay-first-served basis. Most 6-8" and 1 gallon pots are priced at $5.00-$6.00. Plants of other sizes & prices are plainly marked. We currently have a nice selection of herbs, heirlooom flowers, succulents, ever-blooming shrubs, and scented geraniums. Check back often, as we're always adding something new to the list! And, if you don't see what you're looking for, let us know....maybe we just haven't gotten it listed yet, or, if not, perhaps we can find it for you. RED FLOWERING MAPLE: Tender perennial, this plant is dripping with beautiful "Chinese lantern-like" flowers all year around. Grows to be several feet tall, needs to be pruned to keep a bushy shape. JOEY: This Australian native flower has an unbelievable bloom, looking like a puffy pink Persian cat's tail. A tender perennial, it supposedly self-seeds easily. This is our first year to grow it, we'll see how that goes! SUCCULENTS: We have a wide assortment of winter hardy and tender perennial succulents. 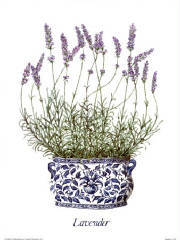 Great for windowsill gardens, rock gardens, or single pot growth. All sizes, shapes and varieties. Too many to describe individually here. Come see. CANDY CORN VINE: Bloom looks just like candy corn. Grows amazingly fast. Will cover a very large trellis in just a few weeks. It's so prolific we refer to it as "Kandy Korn Kudzu!" Tender perennial. PRICKLESS PEAR: Like Prickly Pear, but...prickless. BUDDLEI: We have almost all of the "unusual" colors of Butterfly Bushes available. Light pink, white, yellow and a purple so dark it is named "Black Knight." All are perennial, and droop with flowers all summer long, providing necessary nectar for bees as well as butterflies. ALMOND: Also called "Pretty Polly." Leaves develop a brown center in some growing situations. Flowers are bright pink, the scent is pungently nutty. APPLE (Trailing): Excellent plant for growing in a hanging basket or on a pedestal. Soft gray green leaves grow in a "bushy" shape and share space with prolific small white flowers that grow in sprays that dangle over the edge of its container. Lovely apple-cider fragrance. APPLE (Upright): Nicely defined green leaves on sturdy stems. Definite apple scent, small pinkish flowers. APRICOT: Many plants have common names that actually have little to do with their appearance or scent. Apricot Scented Geranium doesn't really smell like apricots, its scent is fresh and rather citrusy we think. Perhaps the name comes from their lovely color of the flowers. ATOMIC SNOWFLAKE: Large slightly fuzzy, grey green leaves with lovely cream colored variegation. Lemony scent. Pink to lavender flowers. ATTAR OF ROSES: Bet you can't guess the scent of this one. Nope, it's roses! Small light pink flowers (an excellent choice for candying, adding to apple jelly or sorbets and iced fruit) cover the plant in late summer. CHOCOLATE MINT: Many of our clients insist this variety smells "just like Girl Scout Cookies" but the "chocolate" in the name originally referred to the chocolate colored splotch in the center of each leaf. Everyone agrees however that it's a beautiful plant, and delightfully mint-scented. CINNAMON: Small crinkled leaves and pink flowers. Definite cinnamon scent. Good choice for adding to sugars or jellies. A little more finicky than other varieties we've grown, it's worth the extra trouble! 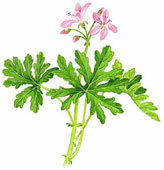 CITROSA (aka CITRONELLA or MOSQUITO PLANT): What scented geranium collection would be complete with a "Mosquito Plant?" Cintronella scent, light pink blooms. CLORINDA: If you prefer showy flowers to anything else about a plant, Clorinda is the pelargonium for you! Very large, flashy orange to cerise flowers cover the plant when it's happy. A strong eucalyptus scent emerges early in the morning, although, as with most scented geraniums, it fades as the day wears on. COPTHORN: The cedary scent takes a back seat to the profuse lavender/pink flowers. A strong and hearty grower, this is becoming one of our favorites. FILBERT: aka 'Schottesham Pet' ...Tiny lacy leaves, profuse hot pink flowers, good variety for creating topiaries. FRENSHAM: Leaf is shaped somewhat like a maple. Delightful lemon scent. Flowers are not as profuse as some other varieties, but are a lovely light pink. GINGER: This species looks quite a lot like "Lime" but it's leaves are a little bit larger. Flowers are much the same as "Lime" as well. Most people agree the leaves have a definite scent of ginger, however some insist they detect a whiff of citrus. LADY PLYMOUTH: Gray green leaves splotched with white. Heady rose scent, lavender flowers. Growth habit makes it a good choice for a container. LIME: Small roundish leaves with a ruffled edge are sweetly lime-scented. The flowers are somewhat larger than most other varieties of scented geraniums and are pale lavender with deeper purple centers. NUTMEG: The only difference we can find in this variety and the trailing apple is the definitely different scent...very fresh and "nutty." Leaves and trailling habit are very similar. NUTMEG: The only difference we can find in this variety and the trailing apple is the definitely different scent...very fresh and "nutty." OLD FASHIONED ROSE: Strong stems, nicely indented leaves and a lovely rose scent makes this one of the most popular varieties for both private and commercial use (rose geranium oil, flavoring jams and jellies and potpourri). Nice shape for container growing. OLD SPICE: Small, mound-forming habit. White flowers. We haven't grown this long enough to know much more about it than that. PEPPERMINT: Large, somewhat sprawling plant. Leaves have a soft, velvety texture. Sprays of small white flowers. By far the most strongly scented of the mint varieties of scented geraniums. Grow in a hanging basket, on a pedestal...leaves that are near the ground are rarely happy. PINE: The pine scent is diffused with just a touch of roses. Great in potpourri. Light pink flower. Sharply divided leaves. PRINCE RUPERT: Truly a prince among pelargoniums, this is a must-have for any collection. A good choice for creating topiaries or pruning into shapes. Slightly lobed leaves and a fresh lemony scent. PRINCE RUPERT (Variegated): Sometimes called "French Lace" differs only from the green Prince Rupert variety with its edging of cream or white and a slightly less defined scent. ROBER'S LEMON ROSE: Spicy lemon rose fragrance. Attractive leaves shaped very much like those of a tomato plant, slightly greyish. Lavender/pink flowers. ROLLINSON'S UNIQUE: Unique indeed with its rose-magenta flowers, dark green ruffled leaves and very pungent scent. One of our favorites. ROSE COCO MINT: The scent is a blend of chocolate and roses with a little bit of peppermint tossed in the mix. Bright rose colored flowers. Leaves are large and slightly fuzzy. SILVERLEAF ROSE: As the name implies, the leaf is edged with silver. A light rose or mauve flower and a lovely rose scent makes this a "must-grow." STAGHORN OAKLEAF: Hmm, wonder where this one got its name? Oh yeah. From the leaf shape. A cross between an oak leaf and a stag's horns. Lobed edges of the leaf are somewhat jagged. Scent is piney. STRAWBERRY: This doesn't always smell exactly like strawberries, but it always has a fruity scent. Tri-lobed leaves, crinkled and small, pink bloom with some red stippling. VAN LEENII: One of the varieties that is sold as having "mosquito repelling properties". Although this variety does have trace amounts of citronellol, it likely is no better at repelling insects as any other scented geranium. It does have a nice citrusy scent, and light pink blooms. WILDWOOD: The leaves of Wildwood have an oak-leaf shape with pale chocolate brown centers. It grows in a somewhat "shrubby" pattern and has a rosy fragrance. Flowers are pale pink with darker pink centers.